A - Z puzzles are a very interesting twist on the standard crossword puzzle. 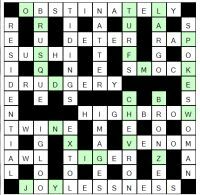 In an A - Z puzzle you are presented with a crossword grid with a difference. All the clues are gone, and most of the letters are already filled in! All you have to do is complete the grid. In order to do so, you will note that there are 26 blank squares left exactly on the grid. Each blank on the grid must be filled with a letter from A - Z in order to fill a valid crossword grid and thus complete the puzzle. Each letter from A - Z must be placed exactly once in the grid, so there will be one 'A' you need to place, one 'B' and so on. Of course, it is not quite so simple, since some letter patterns will have many possible solutions. Therefore in order to solve A - Z puzzle, the key knack you will need to develop is to scan the grid and find places where there is only one word that possibly fits, and then write it in. This will remove some letters, and therefore reduce the options for some other patterns of letters that may have more than one possible word that fits. Be on the look out for where the less common letters can go - for instance if there is a 'U' in the grid with a blank before it, is that where the 'Q' is lurking? Also consider that a word ending in 'IN?' may well have a 'G' in place of the question mark, although of course this is not necessarily the case. By using your knowledge of common patterns in English, together with whittling down the options by placing words that only have one option and seeing which letters are left, you should be able to work your way to the solution for each A - Z puzzle. We hope you enjoy this fairly rare crossword variant brought to you here at Wordy Puzzle.